We spent over 30 hours researching many different varieties of car vacuums that are available on the market and compared them for power, attachments, size, brand reputation, and many more factors. After conducting this research we have determined that the ThisWorx for Car Vacuum is our top overall pick. This versatile car vacuum can take care of wet and dry messes easily and efficiently. The 16 foot power cord provides lots of flexibility for vehicles of all sizes so you can easily reach all the corners and crevices. The powerful suction and HEPA filter provide the kind of results you’re looking for. This car vacuum comes with a 100% satisfaction guarantee. Many vehicle owners can be almost fanatical about their vehicles. This is especially true for someone that considers their car their dream vehicle. To keep your vehicle clean and looking great, you will need a car vacuum. You can use a full size vacuum but the car vacuums are designed to be used in small spaces and can reach things that a larger vacuum would have trouble getting to. The right car vacuum will provide you with the means to keep the interior of your vehicle looking brand new. Cleaning your vehicle will prevent it from losing value and will make it look, smell, and feel better overall. Car vacuums come in a variety of styles, sizes, and price points. With so many choices, you will need to know what to look for to ensure that the car vacuum you purchase will be able to handle the jobs you want to do with it. Take a look at the three reviews below of popular top rated car vacuums that are popular with consumers. These three choices will work for a large variety of vehicle vacuuming needs. If you want to clean your car like a professional but you are having difficulty removing crumbs that have been dropped down in between the seats or on the floor the ThisWorx for car vacuum is just what you need. This handheld vacuum is portable and makes getting all the dirt and crumbs out of your vehicle super easy and fast. You can use this vacuum for wet and dry dirt and it can even be used to vacuum out the ashtray. Vacuuming regularly allows you to get rid of germs, allergens, and bacteria that can be on your car seats and carpets and keep it looking good. The strong suction offers plenty of power and maneuverability. There is a 16 foot power cord that makes it easy to reach all corners of the vehicle that you want to vacuum even with big vehicles. The washable HEPA filter makes maintaining your car vacuum very convenient. Choose from three nozzles that will take care of a variety of vacuuming needs. There is a small cleaning brush that comes with the vacuum so you don’t have to get your hands dirty while you are cleaning the filter. The ergonomic design has a trash container and auto shut lid that keeps all the trash inside the container. The container is clear so you know when it’s time to empty it. The ThisWorx for car vacuum comes with a satisfaction guarantee and a carry bag to store it conveniently as well. Black & Decker is a well-known and respected company that makes power tools and appliances of all kinds including this efficient and powerful car vacuum. You can use this convenient vacuum to clean up dirt and debris from any type of vehicle, RV, or even your boat. This car vacuum is powered by your vehicles 12v battery and plugs right into the cigarette lighter via a 12volt adapter so no separate power outlet or battery is needed. The 16 foot power cord allows for plenty of room to vacuum even large vehicles with ease. The integrated hose is super flexible and makes vacuuming tight spots much easier than using a full sized vacuum. This powerful car vacuum can handle dirt, dust, crumbs, and even gravel. The pivoting nozzle is perfect for getting crumbs and dirt that have dropped down in between your vehicle’s seats. You can also reach any angle thanks to this pivoting feature. The 11.8 ounce capacity allows for plenty of space for dirt, crumbs, and debris. The Black & Decker car vacuum has a re-usable filter that has been PVF 100 approved so you don’t have to buy replacement filters. The size is very compact and easy to handle and is small enough to keep right inside your trunk without taking up too much space. The cyclonic action allows the suction and filter to last longer. The canister is easy to empty and you don’t even have to get your hands dirty. Another benefit to this car vacuum is the 3 stage filtration system that prevents dust from getting into the air. The Black & Decker car vacuum allows you to clean air vents, under the gas and brake pedals, and underneath your seats. The quality and ease with which you can keep you vehicles clean makes the Black and Decker car vacuum perfect for your needs. FORTEM’s car vacuum will help you keep your vehicle looking brand new. The 14 foot power cord allows you plenty of room to move around in your vehicle and get all corners and crevices clean. This handheld vacuum is lightweight and easy to hold and use. It is powered by your vehicle’s 12volt cigarette lighter and can vacuum up dry and wet messes including leaves, dirt, dust, pet hair, small spills and even loose gravel. 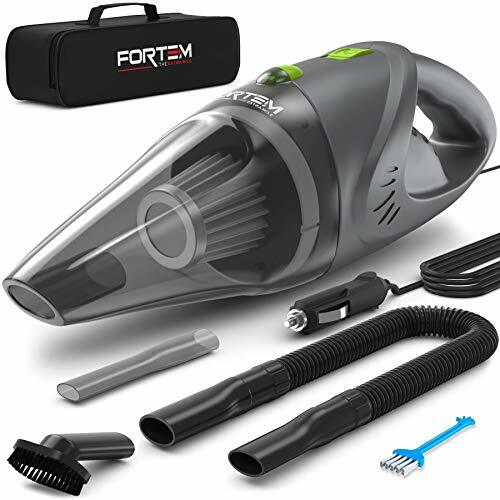 Using the FORTEM car vacuum will help allergy sufferers since the vacuum captures allergens that are not visible to the human eye and sends them to the dirt canister through the HEPA filter. Choose from a selection of three different attachments that include a crevice tool, brush, and standard tool. This eco-friendly, easy to handle car vacuum offers high performance and convenience with features like the easy to empty, push button canister that can be emptied without getting your hands dirty. The HEPA filter is environmentally friendly and can be washed and reused, saving you money on replacement filters. The FORTEM car vacuum comes with a 100% guarantee that you will be satisfied or you get your money back. It also has a 1 year limited warranty. Give it a try and see how easy it is to keep your car looking good as new on the inside. These three top rated car vacuums are portable, lightweight, and have the power you are looking for to tackle vacuuming jobs in all your vehicles. They are affordable, reliable, and will make keeping your vehicle’s interior clean super simple. 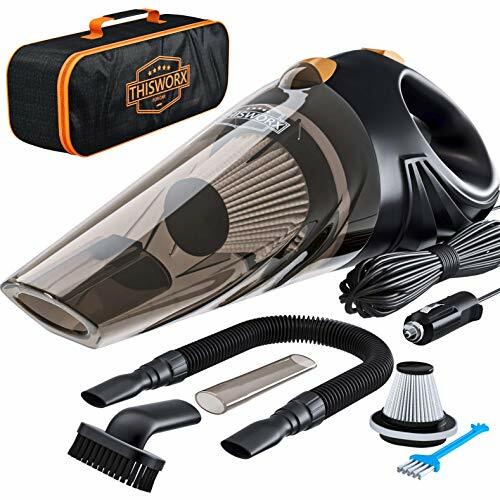 When you are ready to purchase a terrific car vacuum choosing from one of these three selections is very smart because they are popular with customers, have good reviews, and have powerful motors and excellent suction. Should one of these top three choices not meet your needs, the buyer’s guide we have provided below will help direct you on your search so you can find the perfect car vacuum for your needs. There are many different types of car vacuums out there so make sure you know what kind of vacuuming jobs you will be doing on a regular basis. There are many reasons to purchase a handheld car vacuum for your vehicle. These easy-to-use, convenient specialty vacuums can be easily stored in the trunk without taking up too much room. Below we have several of the benefits that you can enjoy by purchasing a car vacuum. There are many things you want to look at when you are searching through the many different car vacuum models on the market. Start by determining your needs so you know what models won’t work and which ones can be put on your possible list. We have listed the important consideration you want to look at when researching the different car vacuums you are interested in. Battery vs. Plug-in – The difference between battery operated car vacuums and those that have to be powered is pretty simple. Battery operated car vacuums are powered by batteries that need to be charged in between uses. Plug-in car vacuums work by being plugged into a wall outlet or your vehicle’s cigarette lighter. When it comes to choosing one or the other that is largely up to personal preference. If you will only be using the car vacuum for your vehicle, then you should be able to use the battery operated one with no problems. If you also want to use the car vacuum to clean RVs, boats, stairs, and other small messes that don’t really need the full sized vacuum, you would be better served to get the corded models. Most battery operated car vacuums will only last about 15-20 minutes on a full charge so that is another factor to consider. If you vehicle is large or a real mess that will take a while to clean, a battery operated model will only leave the job half done until it recharges and you frustrated. Battery Life – If you are looking for a battery operated car vacuum, you will be dealing with the battery and re-charging it between uses. There are many types of batteries that are used in car vacuums. The best vacuums have lithium-ion batteries. Lithium-ion batteries hold their charges much longer than other batteries. They also charge a lot quicker and have a long life expectancy. Look for car vacuums that have lithium batteries so you don’t have to deal with your car vacuum running out of juice halfway through a cleaning job. With the right model that has the right battery you won’t have to worry about this problem. Watts – The wattage of the car vacuum tells you how strong the motor is and how effective it will be sucking up dirt, dust, and crumbs in your vehicle. The wattage level is similar to horsepower in a vehicle. Sometimes you will see the term Air Watts which focuses on the suction power that the vacuum has. When looking for a good quality car vacuum, air watts of 15 or above is a good quality car vacuum that will take care of your vehicle cleaning needs. Bagless – Car vacuums that have bagless designs are very convenient to handle and work with. The majority of car vacuums have a canister that holds the dirt and debris that has to be periodically dumped. This is much more preferred over bagged vacuums that require the purchase of new bags and the hassle of changing them out. Not only are they less headache, they save money too. Size & Dimensions – Dimensions of a car vacuum are really not very important because they are not large enough to cause much if any inconvenience. Look for a car vacuum that is lightweight and easy to handle. Small doesn’t mean less powerful unless you have simply looked for the cheapest, smallest vacuum on the market. That could be a real problem. Size of the car vacuum only becomes an issue if there is little to no space to store it. Weight – Weight is another factor you want to look at when researching different car vacuums. Trying to clean in small areas while lugging around a bulky, super heavy handheld vacuum is not going to make you want to do it very often. Fortunately, the majority of car vacuums are typically lightweight and not super bulky so people will like them. Any car vacuum less than five pounds is going to be light enough to hold while you are vacuuming, even if you are deep cleaning for a long time. Efficiency – If being eco-friendly is important to you, look for models that are listed as power star qualified which shows that the model you are looking at is energy efficient. Customer Service – Customer service is always important when you purchase a product in case there is a problem with the product you have purchased. The three top rated car vacuums we have featured above all come with satisfaction guarantees so if there is a problem and they don’t work as expected or something is wrong mechanically; good customer service will ensure that you get taken care of. Attachments – Most of the car vacuums on the market come with a few attachments that offer the ability to do special cleaning such as in crevices and underneath seats which can be really hard to reach. Some attachments include brushes which are great for upholstery and carpets and other attachments. Suction power – The suction power that a car vacuum is the most important point you will look at. It doesn’t matter what the car vacuum looks like, how lightweight it is, or how easy it is to use if it doesn’t have good suction power. A good way to find out information on the suction power a vacuum has is to read reviews and comments from customers that have already purchased the car vacuum and who are using it. Their comments will give you information on the performance of the vacuum that you won’t get on the sales site. Make sure that the model you choose has a lot of suction power. This will ensure that you will get the kind of performance that you want. Style, Design & Color – While these points are not crucial to the performance of a car vacuum, many people care about how it looks and even what color their car vacuum is. People tend to be drawn to products they are visually attracted to so it is not unusual to initially choose something based on how it looks or what colors it has. Remember that these features can be added to your list of considerations but the most important ones to look at are the features that will affect performance, suction, ease of use, etc. Performance – The performance of a car vacuum is extremely important when it comes to getting the kind of results you want from a vacuum. There are many factors that will help you determine the performance of a particular car vacuum you are interested in purchasing. The parameters recommended are listed below. Many of these parameters can be checked by reading the product description and others you will have to look at reviews, customer comments, and the product manufacturing website. All of these factors come together to create the overall picture of the car vacuum you are looking at. Look for the models that have positive ratings on all of these points and you will have an excellent product. Tank capacity – Most car vacuums have a canister that collects the dirt, crumbs, and dust that you vacuum up. Canisters vary in size and usually range between 350-650 ml. The larger the canister the less emptying you’ll have to do. Many of the vacuums on the market have canisters that do not require you to have to get your hands dirty emptying them. This feature makes them very convenient and easy to use and clean as well. Customer comments and reviews – One of the best ways you can learn about a particular car vacuum you may be interested in is to read reviews and customer comments about it. You can learn a lot about a vacuum by hearing what others have to say that are already using it. Sales pages are designed to focus on only the good, selling points so it can be hard to get a true, honest look at the product you are looking at. Customers that have purchased a car vacuum are usually very happy to talk about their experiences, good and bad, so you will get a very honest review of how it works, the suction it has, the durability of it (did it break the first time it was used?) and many other really important pieces of information. Remember that not all reviews are legitimate but if the vacuum has a lot of reviews and a high rating, the customer comments and reviews can more than likely be trusted. Storage – What do you do with your car vacuum when you are not using it? Depending on the model you choose, there are several carrying case options that these compact car vacuums have. Maybe have soft sided storage bags with zippers; others can possibly have hard cases that protect it well from bumps and jostling. Because of their small size, storing a car vacuum IN your car is typically not a problem at all. Many people put them in the trunk of the vehicle when they are not using them so they are easy to get to without taking up passenger space. The right storage case will keep dust and dirt off of your car vacuum so it lasts a long time while providing the kind of performance and suction you want. There are two types of car vacuums on the market: cordless and corded. Each type has advantages and disadvantages. A good car vacuum will perform well regardless of whether it is corded or cordless so in some respects, personal preference is key in this decision. Below we have listed the characteristics of both types of car vacuums so you can use the information to help make your decision. Cordless car vacuums – Cordless car vacuums are operated by battery power and do not require an electric outlet or 12v power supply from the vehicle. There is no cord to get in the way or be restricted by which gives you a lot of flexibility in cleaning large vehicles, RVs, or boats. Some of the best portable car vacuums are battery operated. If you choose this type look for models that utilize superior quality batteries such as the lithium-ion batteries so you get a good, strong charge and a longer operating time. Cordless car vacuums will still have all of the features that a corded model will without the cord. Some worry that a battery operated car vacuum doesn’t have the same suction strength that a corded model has and this can be true with some models. A high quality, cordless car vacuum will not have this problem and will have excellent suction. Corded car vacuums – If you only vacuum out your vehicle once in a while a corded model could work very well for you. You will need access to a power source of some kind when using a corded vacuum. For the most convenience, look for models that can be powered by AC AND DC power. A corded car vacuum offers the user a lot of flexibility and can be used for all kinds of small vacuuming jobs in and out of the vehicle. Many use them for other things as well such as cleaning up small messes in the home, cleaning stairs, and reaching other areas that may be hard for a regular sized vacuum to reach. There is no arguing that a car vacuum is the best choice for cleaning the inside of your vehicle’s interior. You will want to sort through all of the choices available to see which ones have the features that you are looking for including price point, special features, accessories, and other factors. Decide which features are the most important and that match your needs the best and you will not have to worry about having wasted your money. 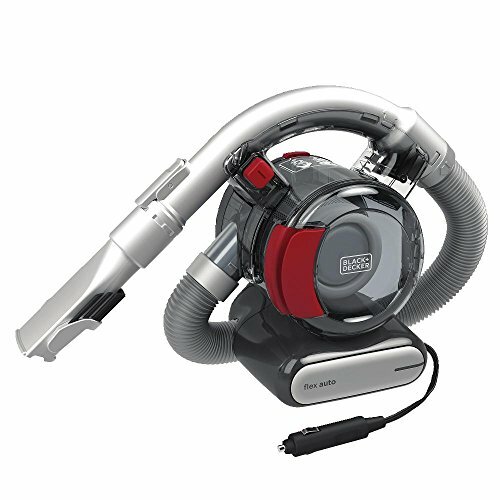 The purpose of this buying guide and the three top rated reviews we provided above is to give you all the tools you need to search through many different car vacuum models and eliminate the ones that won’t work because of weight, budget, or whatever factors don’t line up with what you are looking for. All three of the top rated car vacuums in this guide could be excellent choices for anyone looking for a high quality, long lasting and durable car vacuum. They are manufactured by reputable, well-known companies that routinely produce durable products that perform well, last a long time, and are easy to use. The information in this guide will help you determine which car vacuum is the best choice for your needs, preferences, and wallet so you end up with a car vacuum you will have for a long time.